I'm always trying out new crochet techniques. It's one of my favorite things. And last week I decided to have a go at Tunisian Simple Entrelac stitch. There is a written description and a chart in my favorite crochet bible: The Complete Photo Guide to Crochet by Margaret Hubert I am usually pretty good at reading written patterns and charts don't freak me out either but this stitch had me totally flummoxed. After an hour or so of trying to figure it out I went to google for a video. Mikey of the Crochet Crowd has a extremely good one on this technique: How to Tunsian Crochet - Entrelac Blankets in Rows and this did the trick. I was once more diving into my donated yarn stash and here's my rather seasonal charity blanket. It's all about the pumpkins right now in Texas. I found making these cute little textured squares incredibly absorbing. I've had a little go at Tunisian before but I didn't fall in love with the technique. It was one of the required swatches when I took my second Craft Yarn Council certificate back in late 2014/early 2015. I recall taking the longest time to figure out what to do with the edges of my swatch. I'm not quite sure what I was doing. I just wasn't happy and ripped it out half a dozen times. I did like the texture of the completed swatch a lot though when I finally got there. 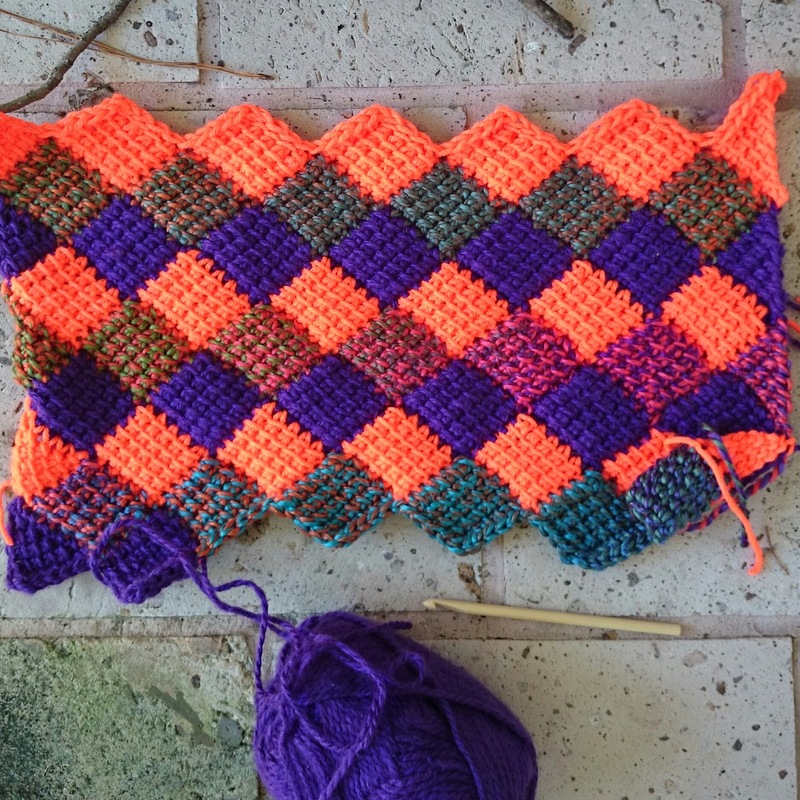 You can use a standard crochet hook rather than a Tunisian hook for entrelac since you only have at most 7 loops on your hook (well for a six stitch wide square). You must chain the number of stitches you want for the whole width of your blanket before you get started. You use a crochet hook two sizes larger for Tunisian crochet than a standard crochet hook because the resulting fabric is extremely dense. There is an amazingly gorgeous top I might try now I that have mastered entrelac technique: Yoga Top by Elena Fedotova Take a look at it. I'm sure you may well be tempted too! There are some great entrelac knitting books too which will give you even more ideas about construction of garments and accessories with entrelac. That's a great idea Jodie! !Thank you!